Relatives and local residents block a main road to protest the killing of a family by counter-terrorism officers in Lahore, Pakistan, Jan. 20, 2019. The arrests came a day after the officers shot a middle-aged couple, their teenage daughter and a family friend, in what the officers had described as a shootout with Islamic State militants. Relatives and witnesses say the victims were shot in cold blood. According to Dawn, a Pakistani newspaper, relatives of the family are holding a sit-in protest in Sahiwal against the killings and have not allowed officials to remove the bodies. Pakistani television aired footage of the family's son, according to Dawn, saying his family was traveling to a wedding when police began shooting at them. He said there were no weapons in the car. Dawn reports witnesses confirmed no weapons were fired from the car. 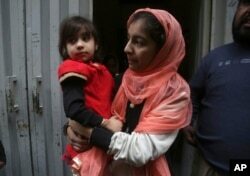 Hadiya Khalil, left, who survived a shoot-out by counter-terrorism officers, is carried by an unidentified relative at her home in Lahore, Pakistan, Jan. 20, 2019. Prime Minister Imran Khan said on Twitter: "While the CTD has done a great job in fight against terrorism, everyone must be accountable before the law." He also posted: "Still shocked at seeing the traumatized children who saw their parents shot before their eyes. Any parent would be shocked as they would think of their own children in such a traumatic situation. These children will now be fully looked after by the state as its responsibility." Two young daughters of the family also survived.